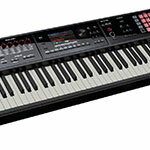 The Korg KROME-88 is perfect for piano players, studios, gigging musicians, bedroom players and more. With a full 88 note Natural Piano Touch action, sounds derived from the world leading KRONOS workstation and versatile editing and recording capabilities, KROME is an essential instrument for the enthusiast and pro alike. 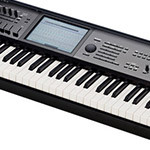 The Korg KROME is a workstation which out specs its closest competitors and has adapted technology from the world class KRONOS workstation creating one of the most versatile and professional sounding mid-range workstations in its class. Equipped with 88 touch sensitive, piano weighted keys and a large colour touch screen interface - the KROME 88 offers a superior musical experience with versatile sound editing and recording possibilities right at your fingertips. 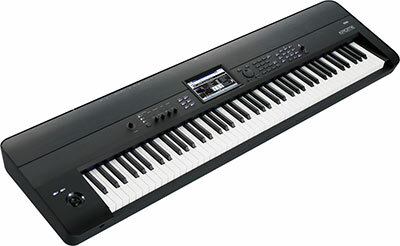 The Korg KROME-88 German Grand D piano is developed from the flagship KRONOS workstation. Each and every note has un-looped samples so the piano has the authenticity and realism of a real grand piano like no other workstation its class. The combination of 88 piano keys with such an incredible sound makes the KROME perfect for piano players and gigging musicians that need a high quality, lightweight, professional instrument. Korg have hand-picked the sounds for the KROME-88 and made sure that every one is the best that it can be from a selection of their existing instrument range. Sounds for every genre of music have been included. The electric pianos have also been specially designed for KROMEs sound engine with 8 velocity layers per sound for a truly biting performance when demanded. Flange, phase, delay, distort and modify your sounds with the massive internal effects system. Up-to 5 insert effects, 2 master and 1 total effect system can be used simultaneously and assigned to any part or culmination of parts you desire. Distortion guitar to massive delay synths are no problem for the huge KROME-88 internal processing power. There are 193 different effects available in the Krome 88 and each effect can be modified to get the exact sound you are after. 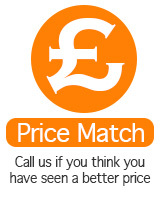 If the KROME does not have the effect you want then it must not exist! Interacting with your instrument is an essential part of getting the most from it. With such a huge array of features and controls Korg made use of a large colour touch screen LCD display. All your required settings, parameters, sounds, sequencer data and more is all easily accessible via the touch panel. Simply touch the section you need to access and all the associated menus and controls are presented on the display clearly. A number of shortcut parameters are usually displayed so in the sound pages it is easy to modify common sound controllers such as cutoff, resonance, release, EQ and more. No more messing around using cursors to navigate through multiple menus - the Korg KROME has instant access at the touch of your fingertips. The Korg KROME has dual polyphonic arpeggiators and a dedicated drum track. Both arpeggiators can run basic note patterns and also have riffs covering different genres and instruments such as bass, synth licks, drums and more. Multiple parts can be triggered and can be played with the drum track which has hundreds of preset drum patterns which use the hi-quality Korg drum kits. Drum track can be used with combis and single voices to add that extra sparkle to your playing. Located on the left side of the KROME panel are 4 controller dials which have preset operations as well as assignable operations. Instant access to tweak and modify your sounds is so important for live use and the controller knobs have many functions they can be assigned to, to take full control of your performance. Whilst using the powerful arpeggiator system you can adjust the feel of the patterns with the Step, Swing, Gate and velocity controls in the controller knobs. Tweak away with the dials and create fresh patterns and ideas for your music. Creating your musical masterpiece has never been easier - by connecting a single USB cable to the KROME 88 and your computer you can make use of the free Korg KROME editor and also control everything from within your favourite DAW. USB allows MIDI data transfer between the instrument and computer and makes the computer an incredibly powerful multi-tracking recording system (software required). The Free KROME Editor software allows you to modify sounds right down to oscillator level and modify filters etc. You can also take control of combinations and sound layering all from the computer screen making opertaion incredibly easy and versatile. KROME-88 can capture all your ideas and inspiration at the touch of a button with its versatile 16 track MIDI sequencer. If inspration hits while using a combi, the sequencer can capture all you ideas there and then for editing later. The high resolution sequencer hones a new skill compared to even the KRONOS workstation - a piano roll editor. WIth the touch of your finger or stylus on the touch-view interface, any individual notes, volumes, pan controls and more can be edited in the piano roll screen. By simply dragging the start and end of each note on a grid it is possible to fix, create and work you way through your musical masterpiece with ease. Korg KROME is fitted with SD card storage to keep all your files and settings safe. Connect the USB to the computer and the KROME can be used as a MIDI controller and can be controlled with the free Korg KROME editing software available for download from the Korg website. Full access to parameters and features are done with ease. The plug-in editor can be used within any of you existing DAW software for an amazing studio experience. Making sure you can back up all your settings is essential. The built in SD Card slot allows you to backup all your files and setting with ease.